Salvation means to be saved from spiritual and physical death. Jesus Christ's death and resurrection broke the bands of death for all mankind, and everyone born on the earth will be resurrected. Through His magnificent Atonement, Jesus Christ ransomed mankind and provided salvation to all except those who have a perfect knowledge of Him but reject Him (see Sons of Perdition) and exaltation to those accountable souls who accept Him and follow Him. Latter-day Saints believe that children who die before the age of accountability are saved and exalted through Christ's grace. Some handicapped people never mentally and spiritually reach the age of accountability, and are considered innocent all their mortal lives. In the 1995 statement “The Family: A Proclamation To The World,” the First Presidency and Council of the Twelve Apostles of the Church of Jesus Christ of Latter-day Saints declared that all people are the literal sons and daughters of heavenly parents. IN THE PREMORTAL REALM, spirit sons and daughters knew and worshipped God as their Eternal Father and accepted His plan by which His children could obtain a physical body and gain earthly experience to progress toward perfection and ultimately realize their divine destiny as heirs of eternal life. The divine plan of happiness enables family relationships to be perpetuated beyond the grave. From God's glorious presence, mankind, born on earth, began the mortal journey of gaining a physical body and experiences to return back to God. Jesus Christ's redeeming grace overcame the effects of Adam and Eve's transgression in the Garden of Eden, thus enabling all humans born in the flesh to be innocent and pure. “God having redeemed man from the fall, men became again, in their infant state, innocent before God” (Doctrine and Covenants 93:38). “The Son of God hath atoned for original guilt, wherein the sins of the parents cannot be answered upon the heads of the children, for they are whole from the foundation of the world” (Moses 6:54). Jesus Christ's Atonement ransomed mankind from the Fall, so that all men and women “will be punished for their own sins, and not for Adam's transgression” (Article of Faith 2). “Little children are holy, being sanctified through the atonement of Jesus Christ” (Doctrine and Covenants 74:7). In the Book of Mormon, the prophet Moroni recorded a letter received from his father Mormon rejecting infant baptism before the age of accountability, by describing how the Savior's redemption negated the need for infant baptism. And after this manner did the Holy Ghost manifest the word of God unto me; wherefore, my beloved son, I know that it is solemn mockery before God, that ye should baptize little children (Moroni 8:7-9). Because of Christ's atonement, each person is born into this world pure and undefiled. While the child's environment immediately begins to impact his or her learning and outlook, each child begins life unfettered and unencumbered by sin. In fact, the Savior said little children cannot sin until they are accountable. “Behold, I say unto you, that little children are redeemed from the foundation of the world through mine Only Begotten; Wherefore, they cannot sin, for power is not given unto Satan to tempt little children, until they begin to become accountable before me” (Doctrine and Covenants 29:46-47). The Lord identified the age of accountability as eight years old. “And their children shall be baptized for the remission of their sins when eight years old, and receive the laying on of the hands” (Doctrine and Covenants 68:27). He that supposeth that little children need baptism is in the gall of bitterness and in the bonds of iniquity; for he hath neither faith, hope, nor charity; wherefore, should he be cut off while in the thought, he must go down to hell. Wo be unto them that shall pervert the ways of the Lord after this manner, for they shall perish except they repent. Behold, I speak with boldness, having authority from God (Moroni 8:14-16). 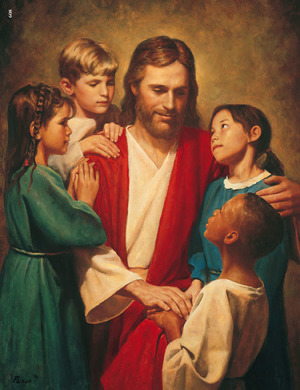 During the Savior's ministry, He often referred to little children as examples of those who inherit the kingdom of God. And said, Verily I say unto you, except ye be converted, and become as little children, ye shall not enter into the kingdom of heaven. Whosoever therefore shall humble himself as this little child, the same is greatest in the kingdom of heaven. Take heed that ye despise not one of these little ones; for I say unto you, That in heaven their angels do always behold the face of my Father which is in heaven. … it is not the will of your Father which is in heaven, that one of these little ones should perish (Matthew 18:1-4,10, 14). Little children do not perish, but are saved from physical and spiritual death in the kingdom of God. And I also beheld that all children who die before they arrive at the years of accountability are saved in the celestial kingdom of heaven (Doctrine and Covenants 137:10). Joseph Smith taught the doctrine that the infant child that was laid away in death would come up in the resurrection as a child; and, pointing to the mother of a lifeless child, he said to her: ‘You will have the joy, the pleasure, and satisfaction of nurturing this child, after its resurrection, until it reaches the full stature of its spirit.’ There is restitution, there is growth, there is development, after the resurrection from death. I love this truth. It speaks volumes of happiness, of joy and gratitude to my soul. Thank the Lord he has revealed these principles to us” (Smith, Gospel Doctrine, 1919 p455–56). The Savior's Atonement provided the perfect vehicle for God the Father's love and mercy to redeem and sanctify little children. A child is an heir to the kingdom of God and joint-heir with Christ; “therefore all that my Father hath shall be given him” (Doctrine and Covenants 84:38). This page was last edited on 4 September 2013, at 11:22.